Teza has been for 30 years now the safe solution to our need to exterminate unpleasant crawling or flying insects and moth insects.Teza products are a result of intense research. With new generation insecticide/insect repellent ingredients, they bring innovation to your home. 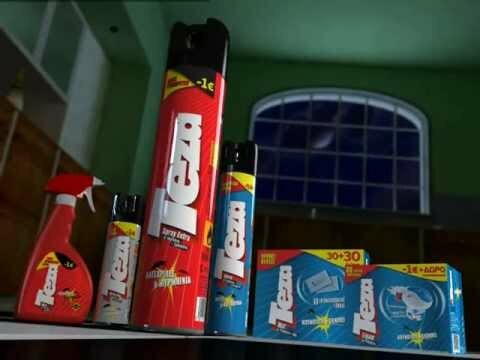 For cockroaches, moth and all crawling insects to disappear, there is only one way: Teza! TEZA insecticides for flying insects repel flies, gnats, mosquitoes and tiger mosquito. The active ingredients repel annoying insects and prevent their intrance. Even those insects that may have remained in place are inactivated and do not bite. Available spray, mat tablets & plugins, liquid form & plugins & coils. TEZA insecticides for crawling insects and aids exterminate and kill them directly. From foams with special applicator to traps for the complete extermination of the colony TEZA provides products that can satisfy your needs and save you from annoying insects. Available MEC without propellant, sprays & baits. Teza moth paper kills moth from clothes, protecting wool (knitted, costumes, carpets), fur and leather, if kept indoors. Packaging of 10 sheets.